Amid an escalating arms race, civil defense drills offered comically simple strategies for surviving an atomic attack. 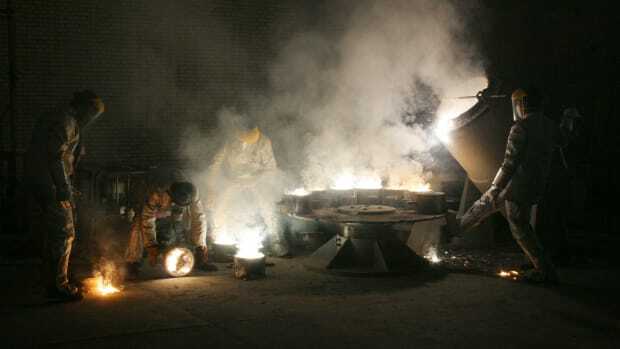 On August 29, 1949, the Soviet Union detonated its first nuclear device at a remote site in Kazakhstan, signaling a new and terrifying phase in the Cold War. 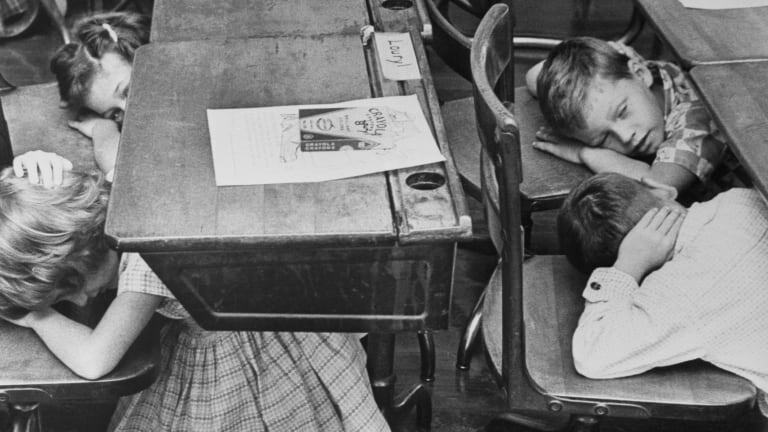 By the early 1950s, schools across the United States were training students to dive under their desks and cover their heads. The now-infamous duck-and-cover drills simulated what should be done in case of an atomic attack—and channeled a growing panic over an escalating arms race. The school drills, which were part of President Harry S. Truman’s Federal Civil Defense Administration program, aimed to educate the public about what ordinary people could do to protect themselves—and they were easy to mock. After all, how was ducking and covering really going to protect you from a nuclear bomb detonating your school? But according to Wellerstein, in some scenarios, the drills could have actually helped. In 1951, the FCDA hired Archer Productions, a New York City ad agency, to create a film that could be shown in schools to educate children about how to protect themselves in the case of atomic attack. The resulting film, Duck and Cover, was filmed at a school in Astoria, Queens, and alternated animation with images of students and adults practicing the recommended safety techniques. As cheery music played, the film’s animated hero, Bert the Turtle, is shown dropping to the ground (“DUCK!”) and retreating into his shell (“COVER!”) after an explosion. An atomic attack, in the film, is presented as one more danger children could learn to protect themselves against, similar to fire, automobile accidents, and even a bad sunburn. 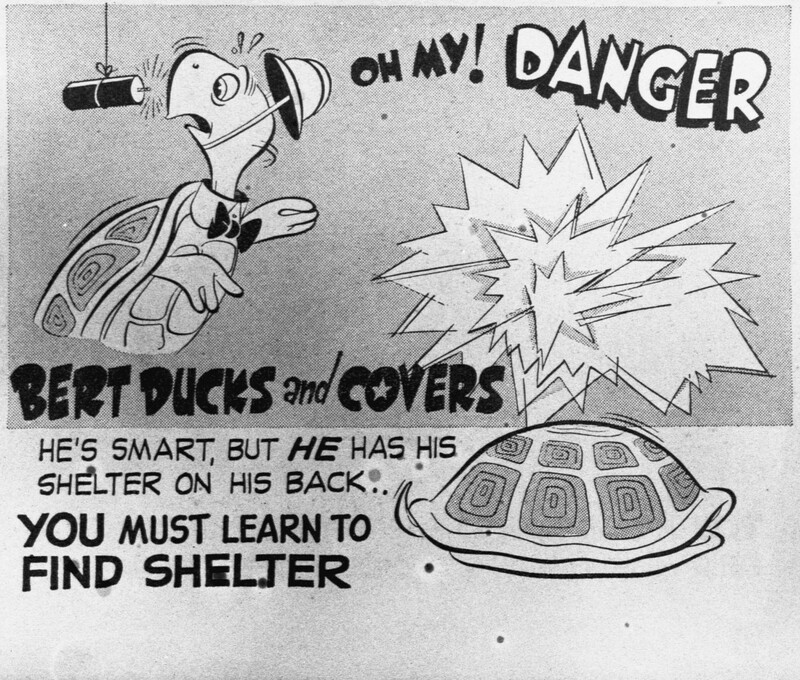 The 1950s film Duck And Cover depicted safety techniques in preparation of the dangers from Soviet nuclear attacks. In the case of an attack, the film instructs students to make like Bert: duck under tables or desks, or next to walls, and tightly cover the back of their necks and their faces. 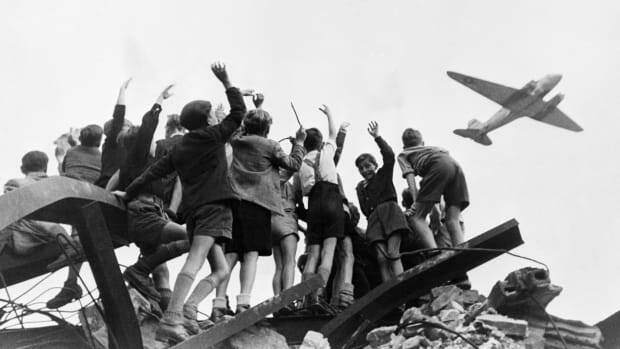 If they were out and about, and didn’t know the nearest safe location, they were told to ask the nearest adult—and to always obey the civil defense workers tasked with ensuring their safety. Today’s viewers may well react negatively to Duck and Cover and its jarringly pleasant, light tone. 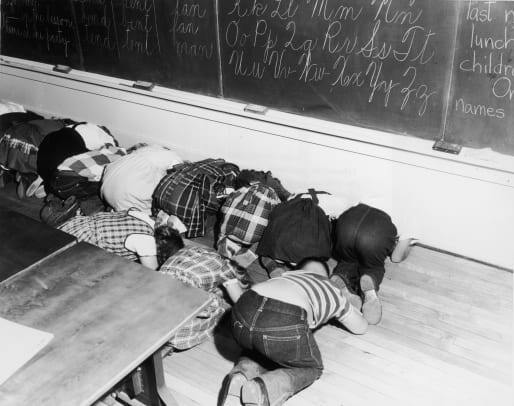 But in the early ‘50s, most Americans knew little about what actually happened when an atomic bomb exploded, and the idea was to warn, but not frighten, the school children taking part in the drills. 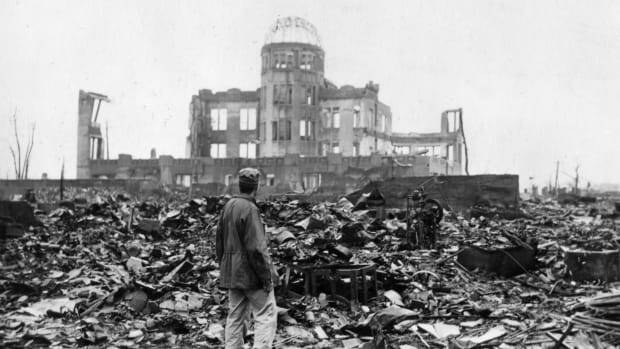 “The juxtaposition of that kind of imagery—let&apos;s read a book and tell stories—with the horrors of an atomic bomb, this leads a lot of people then and now to say, I don&apos;t think this is going to work,” says Wellerstein. By the early 1960s, the U.S.-Soviet arms race had heated up to the point that duck and cover came to look like an even more inadequate response to the nuclear threat. 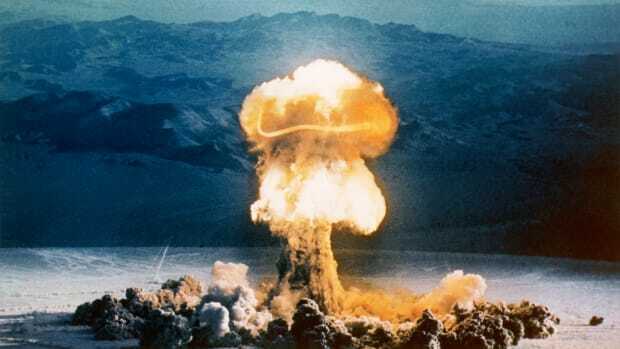 In 1961, the Soviets exploded a 58-megaton bomb dubbed “Tsar Bomba,” which had a force equivalent to more than 50 million tons of TNT—more than all the explosives used in World War II. To confront the growing nuclear threat, the focus of U.S. civil defense had moved on to the construction of fallout shelters, which the FCDA (by now renamed the Office of Defense Mobilization) recommended as the next step in protection against a possible nuclear disaster. 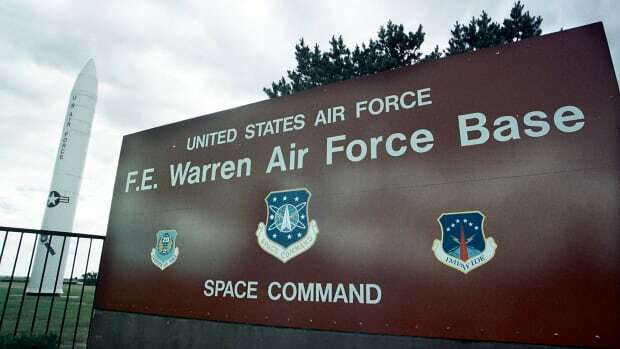 On the heels of the Sputnik flight in 1957, motivated lawmakers passed the National Defense Education Act, underlining the perceived importance of America’s schools in the battle for Cold War supremacy. Another key criticism of duck and cover focused on the intent behind it: what many people saw as the government’s way of sanitizing nuclear weapons and making people complacent and accepting of the new status quo. 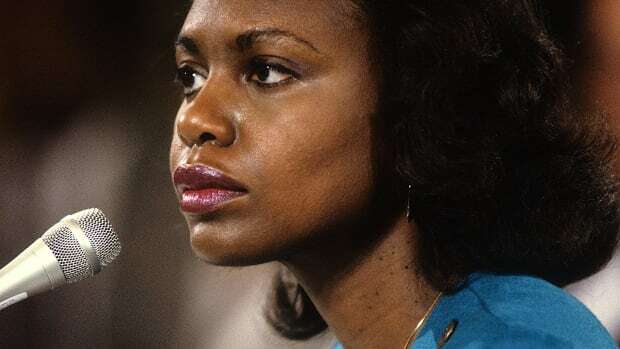 In fact, as historian Dee Garrison has argued, students’ responses to civil defense drills in schools would later fuel antiwar and antinuclear activism, on the part of both outraged parents and the students themselves.